SESQUICENTENNIAL: 150 Years of Masonic History in East Harris Co.
Masonic activity in East Harris County can be traced to 1858, when a lodge was authorized at a site known as Oak Island, which was land near the current Burnet park. Under authorization from the state organization, the Grand Lodge of Texas, Sampson Lodge No. 231 was chartered on June 16, 1859. It was named for Brother Henry Sampson of the Grand Lodge. A log cabin was built on the site, and served as the meeting place. However, it burned in 1863, was rebuilt, and then destroyed again by a great storm in 1875. A set of ceremonial jewels, given to the lodge by the Grand Lodge in 1859, survived the storm and were found attached to the doorknob of the lodges front door, floating in the bayou. Today, those same jewels, 150 years old, reside and are used by the Sampson Lodge. Although the Lodge continued to meet in the Lynchburg area after the storm, the subsequent great hurricane of 1900, which destroyed much of Galveston, convinced them to rebuild further inland. Temporary quarters were found in a barn in Highlands at the Betts farm near White Cemetery, and a permanent Lodge building was built in Crosby, and opened June 8, 1901. This was a two story building that served the lodge well for its second 50 years, and until the decision was made to move to a new lodge building in Highlands. In 1951, the brethren voted to move the Lodge to Highlands. A new building was constructed on Avenue D by the Masonic Lodge members. Within the year the building was debt free because the construction work was by members and friends, working with volunteered time and materials. The first Worshipful Master of the Lodge was M. M. Michan. The second Past Master of Sampson Lodge was Brother Robert Blalock, from 1860 to 1863 and 1870 to 1872. He is buried on the banks of the San Jacinto River on Eighth Street in Highlands, in a private cemetery plot. Todays Sampson Lodge No. 231 is deeply involved in community activities. They have recently laid the cornerstones for our two new schools, Highlands Junior School, and Goose Creek Memorial High School, and they held a meeting in Burnet Park in Lynchburg on the 150th anniversary of their charter near that same place. They annually award a Community Builder Award to a non-masonic member of the community, and a Golden Trowel award to a mason of merit. 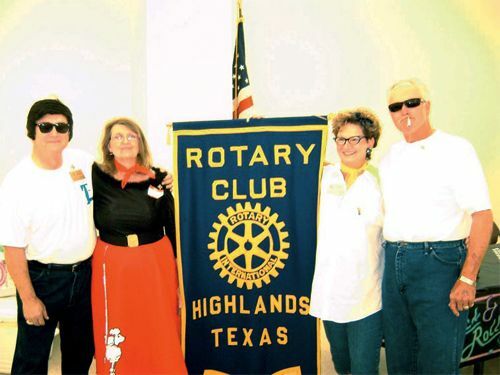 Other activities that the Lodge participates in are the Highlands Jamboree and Parade, Clean-up Day, Yellow Apron Day to solicit money for the Shriners Hospitals, Christmas Tree Ceremonies in the park, an annual Brisket Fundraiser whose funds are used to support needy families in the community, and the Northshore Rotary Club fish fry, where the club helps cook and in turn received a generous donation from the Rotary club for the Shriners Hospital in Galveston. HIGHLANDS  The Community Center was the site of an overflow crowd of well-wishers, as the Masonic Sampson Lodge No. 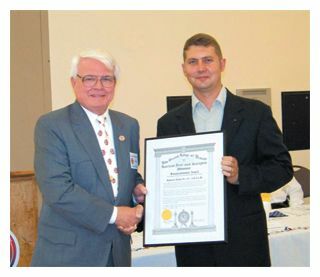 231 took note of their 150th anniversary with a chicken dinner and a prestigious ceremony attended by many statewide Masonic officials and current and past members of the local Lodge. Hosted by current Grand Master Travis Major, the ceremony was a pleasant reminder of the accomplishments of the lodge over the years, and a look back at a rich history that involved many of the pioneers of the State of Texas. A Proclamation honoring the Sampson Lodge on their 150th anniversary was read and presented to Grand Master Travis Major by the Grand Master of the Grand Lodge of Texas, W. David Counts, Jr. Counts told how Masonry was the oldest fraternal organization in the world, the largest, and the most philanthropic. He said the goal of Masonry is to take good men and make them better. He spoke of the Masonic core values, and how Masonry emphasizes fellowship and brotherly love. Counts had a framed Proclamation commemorating the occasion of the 150th Anniversary on June 16th, and todays celebration. In addition to the Proclamation ceremony, the audience was treated to live Blue Grass music by Before Electricity. Cooking for the event was by the Henderson Cook Team, and other volunteers. Many in East Harris County were touched and sorrowed by the news that Mark Mulloy, well known businessman, Rotarian and iconic member of the community, had passed away on Sunday morning, ending his valiant battle with Melanoma skin cancer. His friends, banking associates and fellow Rotarians had followed his struggle with the cancer, as he was treated for over three years at M.D. Anderson Cancer Hospital. They supported him with a show of wrist bands and prayers. Mark was a product of the area, having gone to school in Northshore, and spent most of his business career in this area. He was best known in Highlands and Crosby for his ownership of the two leading banks of the area, Highlands State Bank and Crosby State Bank. After purchasing Highlands State Bank in the 90s, he embarked on an expansion program, and later went on to merge it with Woodforest National Bank. When the opportunity arose, he purchased part ownership of Crosby State Bank, and led an expansion program for that institution that resulted in eight branches throughout the east side of the county. He sold the bank last year to Beaumonts Community Bank of Texas. His career included banking, a law degree, and most importantly an overriding interest in Rotary, both on the local and the international level. He assumed a leadership role in his Northshore club and the District, and made friends and admirers as he went. However, he continued his Rotary friendship where it started, in Highlands, recently donating $50,000 to the local club for their use in community programs. He had continued over the years to be a strong supporter of the Chili Feast, Highlands main fund raiser. Mark was a devoted family man, who leaves behind two outstanding young boys and a loving wife. As busy as he was, he always remembered to inquire and keep track of other peoples families and interests. In anticipation of the many friends who will miss him, the funeral arrangements have been set in large venues so that many can attend. Visitation: Wednesday, June 24, 2009, from 5 – 8 p.m. at Fellowship of Nations Church, 13305 Woodforest Blvd, Houston 77015 (Corner of Woodforest and Uvalde). Mark George Mulloy, 51, beloved husband, father, brother, son and friend to many passed away peacefully at home on Sunday, June 21, 2009, after a 3 year courageous battle with Melanoma skin cancer. Mark was BOI  born on the Island of Galveston, Texas, February 21, 1958 to Dr. Wayne G. and Monica Mulloy. Mark spent his early years at Green Valley Elementary and graduated from Northshore High School in 1976 and later attended Texas A & M University and Sam Houston State University, obtaining a Finance Degree which started his long banking career and led to a law degree from South Texas College of Law. Mark was an exceptional man, husband and father. He was devoted to his family and also had a very large circle of long time friends and business associates, some of whom have known him since elementary school. With a winning smile and a personality to match, Mark was a person to whom others were drawn. He had a natural talent for interacting with people and touched so many lives. Mark loved life. He wasnt happy unless he was going Mach I with his hair on fire. He loved many outdoor activities such as hunting, fishing and golf. He was quite the marksman and hunted all over the US, South America, and even his own backyard. Mark also enjoyed fishing and went to Alaska, Canada, through Texas and the coast lines of Costa Rica. He had a passion for golf and loved chasing that little white ball around the links with his buddies. His golf experiences took him all over the US, Ireland, and Scotland and was privileged to have played Pebble Beach, St. Andrews and even Texaco Country Club. He always said you could conduct more business on a golf course than anywhere else and couldnt wait to get to heaven to play again with his buddy, Glen. As a loving husband and father, Mark, his wife and 2 sons enjoyed many wonderful times together traveling to foreign countries, going to sporting events, seeing America or just spending time in Sargent, America. The importance of family was a priority for Mark. As a devoted father, Mark coached his sons in baseball, basketball, and golf. Mark was a very successful banker and lawyer, with a banking career spanning more than 25 years. After graduating college with a Finance degree, Mark became a state bank examiner which led to loan review at First City and Enterprise Bank. Mark became President of Highlands State Bank before the age of 30 and later bought the bank and merged it with Woodforest National Bank. Being a people bank with people person, he bought and became CEO of Crosby State Bank and most recently sold it to Community Bank of Texas. He loved his extended banking family and many of them have followed him and worked with him for over 20 years. Mark was a true visionary and his strength of character was greatly admired by so many business associates, which contributed to his many successes. Mark was a philanthropist and had a huge heart when it came to giving. His biggest passion was Rotary. With Rotary, he knew he could help and touch the lives of thousands of people, not only at home, but all over the world, and did just that. He became a member of the Rotary Club of Highlands and then later, moving to the Rotary Club of Northshore and was one of their most successful Presidents in 2001-2002. He enjoyed fundraising and travelling with Rotary, having raised huge amounts of money and travelled to Nicaragua and Chile, but mostly helping people on the East side of Houston. The Rotary International theme during Marks year as club president was Mankind is Our Business. Mark lived his life in this with a deep understanding of this standard, along with Rotarys motto of Service above Self. Mark set the bar high for all Rotarians and their friends to follow. Marks family and friends fondly remember him as a loving, strong, fun man of character and many talents. So many people will always remember his kindness and big heart and a personality as bright and winning as his natural smile and laughter. Mark is survived by his loving and devoted wife of 19 years, Carolyn, his 2 sons, Clayton age 14 and Matthew age 12. He is also survived by his parents, Dr. Wayne G. and Monica Mulloy and mother-in-law, Agnes Winans. His brothers Mike Mulloy and wife Lynn, Jeff Mulloy and wife Susan, and John Mulloy. His extended family included brothers-in-law Mike Winans and wife Amy, and Daniel Winans and wife Andrea, sisters-in-law Cindy Risner and husband Bruce and Rissy Winans. He will be greatly missed by his nephew, Mason Mulloy and nieces, Lauren Mulloy and Katie and Kelli Mulloy, Katy Winans, Melissa and Stephanie Winans and Brooke and Heather Risner. Marks family invites friends to visit and share memories from 5:00 to 8:00 p.m. on Wednesday, June 24, 2009 at Fellowship of the Nations Church, 13305 Woodforest Blvd., Houston, TX. 77015. A Celebration Marks life will be held at 1:00 p.m. on Thursday, June 25, 2009 at the Humble Civic Center located at 8233 Will Clayton Pkwy., Humble, TX. 77338. A reception will follow at the Civic Center. Private graveside services will be at San Jacinto Memorial Park. For those desiring, memorial contributions may be made to Northshore Rotary Charitable Foundation, P O Box 9635, Houston, Texas 77213 or the Melanoma and Skin Center at MD Anderson, PO Box 4486, Houston, TX. 77210. Arrangements have been entrusted to Crespo & Jirrels Funeral and Cremation Services, 6123 Garth Rd, Baytown, Texas 77521, 281-839-0700. 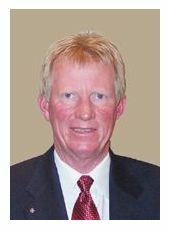 Mark Mulloy, CEO of Crosby State Bank, and a well known businessman in the East Harris County, Crosby and Highlands communities, succumbed on Sunday, June 21, 2009 after a long battle with cancer. 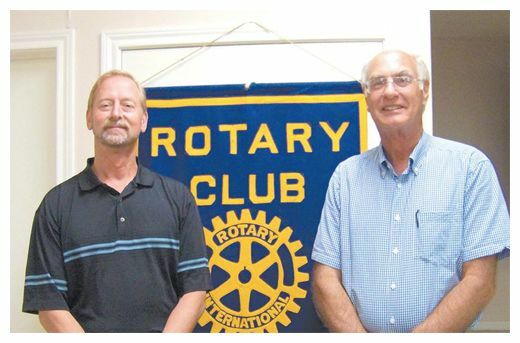 He was active in Rotary and a member and past president of the Northshore Rotary Club. Funeral arrangements are now complete. Mark’s family invites friends to visit and share memories from 5:00 to 8:00 pm on Wednesday June 24 at Fellowship of the Nations Church, 13305 Woodforest Blvd. Houston 77015. A Celebration of Mark’s life will be held at 1:00 pm on Thursday, June 25 at the Humble Civic Center, 8233 Will Clayton Parkway, Humble 77338. A reception will follow at the Civic Center. Private graveside services will be at San Jacinto Memorial Park. HIGHLANDS  Chinquapin School, the private educational institution on Wallisville Road that helps educate economically disadvantaged inner city kids that want to get to college, will get a new Director this summer. The Board of Trustees announced that after an extensive search, they had hired Dr. Charles (Ray) Griffin to be the new Director, effective July 1. Griffin follows Bill and Kathy Heinzerling, who have been at the school since 1978. Heinzerling was named the Director in 1983, following after the founders, Bob and Maxine Moore. Highlands Rotary Club was the venue for the introduction of Griffin to the community, and saying goodbye and thanks to Heinzerling. This was appropriate, since the club helped welcome Chinquapin to Highlands in 1973, and has maintained a supportive relationship since then, with Rotarians such as Jay Bird and Joe Hausberger and Johnny Gaeke involved in the InterAct Club, and other Rotary related events. Heinzerling had indicated to the trustees several years ago that he needed a change, to get new energy into his life. He and Kathy originally planned to head for Colorado and new non-teaching careers, but the economy has tempered those plans, and they will now reestablish in Houston, he said. Heinzerling has seen the school grow in his 32 years there, from 16 boys in a facility at Umbrella Point east of Baytown, to now more than 150 students on 56 acres in Highlands. Once only boys, now there are more girls than boys attending, and the classes have grown to include 6th through 12th grades. Students who apply to attend, must plan on going on to college, and must be accepted by a 4 year college prior to receiving their high school diploma. 85% of them go on to finish and graduate from college. Some have returned to teach as a thank you to Chinquapin. Heinzerling has seen the budget grow from $50,000 the first year, to over $1,800,000 now. There are now over 17 faculty teaching, and the graduating class has grown from 6 the first year, to 18 to 19 in current years. Griffin has been the head of an an inner-city charter school in Denver, prior to coming to Chinquapin. He chose to come here because he believes in the values established by Bob Moore. Griffin sees a national problem in education, and thinks private schools such as Chinquapin could set an example which would help solve the crisis. He sees the pilot model as setting an example where students are challenged, and expected to work hard and long to achieve their goals, helped by dedicated teachers. Griffin comes from a family where his father was a Rotarian and Paul Harris fellow, who started a private school in Washington State with similar goals as Chinquapin. Other models Griffin cited were free private schools such as Hershey or one in Hawaii. Griffin said that Bob Moores ideas, such as love for each other, would overcome some of the educational problems. He saw the schools mixed ethnicity as a good social and learning environment, part of the pilot model he foresees for Chinquapin. Students at Highlands Elementary that had perfect attendance were eligible for a drawing for a new bike, a project of the Highlands Rotary Club. 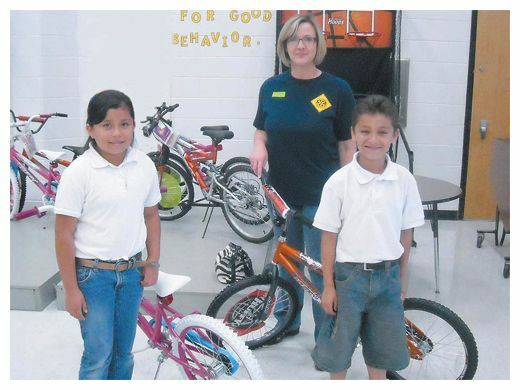 ABOVE, 2nd graders Perla Perez and Edward Roman get their new bikes from Rotarian Denise Smith. CROSBY  The Crosby Fair & Rodeo attracted record numbers of buyers and fans to the Livestock auction, record numbers of attendants at the P.R.C.A. Rodeo and concerts for June 10 through June 13. Her mother, Rhonda Michalsky indicates that the steer was named Highway because he had escaped his confines one afternoon and was found on U.S. 90 bound for Liberty, other than this one steer Delynn does not name livestock. Some $159,025 changed hands at auction from 100 items at bid before resale. Certifab bought four items for $19,350 in total before resale. R.L. Doskocil/C.M.T. purchased eight items. Oil Well Tubular was in on the purchase of seven items. The Fair Board has yet to release official tallies and amounts for auction and for attendance to the three nights of rodeo and concerts. This weeks Star-Courier has a special pull out section with Grand and Reserve Champions and special recognitions for the 63rd Annual Crosby Fair & Rodeo on pages 5 though 8. Check out the Champions gallery! This year Gary Smith purchased the Belt Buckle in honor of his father, Wayne Smith, the 2009 Catalogue was dedicated to Wayne as recognition of his 25 years of service to the rodeo in capacities as Chairman of the Board and President and also as an Honorary Member. 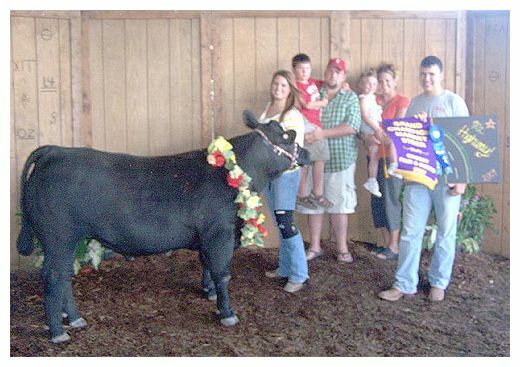 A special tribute to Wayne was presented to the Crosby Fair & Rodeo of 93-94% of the Crosby Fair Catalog. Baytown Youth Fair bought back the Fabians Quilt that Crosby Fair & Rodeo had bought from them for $1000. This year the Thursday night performance attracted more than previous attendance packing the parking full. The sport of Rodeo saw the return of Fred Williamson to Crosby Former World Champion Cowboy. Williamson participated in the calf roping event and his adroit with the lasso and rope is unmatched. Concert opening act David Glenn met with fan before and after his stage performance. He put on an exciting act with contagious enthusiasm that some would call unruly and quite welcome. When Kevin Fowler took to the stage observers could not only tell that most of the ladies wondered that they might be his Butterbean but most of the crowd were mouthing the words to the various songs. Fowler had the most crowd of all performers during all three nights. Local talent Cody Kouba led Friday nights concert performance with an exciting eclectic of old and new, traditional gospel and original songs. Cody packed a tremendous energy into his performance and demonstrated why he is being tapped and winning contests to take a chance in the Memphis scene. The Eli Young Band packed in the college age attendance and this year the Friday night gate seemed slightly higher than last year with Jack Ingram. Certainly the parking lot was full. The Saturday night Rodeo features brought out the championship surge in cowboys. Performances were at a fever pitch. The gate for Saturdays performance seemed slightly off for Gene Watson and the Bellamy Brothers. CROSBY  Dramatic upswing in burglary throughout the Greater Houston Area is being met locally by increased late night/early morning patrols by Ken Jones Precinct 3 Deputies and Harris County Sheriffs Deputies working together. Last early Monday morning, for example, a homeowner was detaining a young person in his yard that had been attempting to get inside his vehicle. The resident called 911 for patrol help to his Newport residence and Deputy Peterson was first to arrive. Peterson obtained a statement that the young man had a friend run off before the resident came out of his house. The deputy then noticed a vehicle drive by and performed a traffic stop and detained the driver. Lieutenant Jasen Rabalais arrived and interviewed the two young men concerning the alarming number of burglary of vehicles that had been experienced in Newport over the past few months. The Lieutenant elaborated about how he had conducted an arrest of two similar young four weeks before burglarizing vehicles. During Rabalais interview, the two young suspects talked of how they had entered vehicles that had been left unlocked throughout Newport and took items from each. A total of seven residential vehicles had been entered by the youths, according to their statements. Rabalais convinced the two seventeen year olds to go with him and see that all the items that had been taken were returned to their rightful owners. All the missing items had been found in their backpack. The youth that was detained in the car was charged with unauthorized use of a motor vehicle. Ikoras Hench, 17, was also charged with burglary of a motor vehicle. Cody Blair, 17, was charged with burglary of a motor vehicle. The Garrett Road area of Sheldon had been home to both the seventeen year olds. Both had been charged as adults in these cases. Deputy R. Clenney assisted with the arrest. Residents would do well to lock their cars at night, large numbers of unlocked vehicles attracts car burglars. HIGHLANDS  The Rotary Club couldnt contain themselves to a normal, quiet installation of new officers and board last week. It was a Back to the 50s and 60s retro affair, complete with clothes, hair styles and accessories to match. And there was even an Elvis to help with the entertainment. Club members gathered at the Community Center for the dinner. In the Highlands Rotary club, each new president gets to set the agenda and theme for his or her year ahead, and it was fitting that the new president, Robert Woodall, would think of this retro evening, because one of his interests is restoring old cars of that era. He is a member of the Baytown Fine Rides auto club, and has his own restored red convertible, seen around town. In addition to club members, (and Elvis), the new president of the District 5890, Ed Charlesworth, was on hand to wish the club well and to swear in the new officers and board. #Woodall was named the Rotarian of the Year by the club, in recognition of his very successful fundraising effort at this years Chili Feast, where over $50,000 was raised for the clubs community and international projects, including 12 scholarships totalling $20,000. Traditionally, the president elect each year is in charge of the Chili Feast. Woodall presented each of his officers and board with pins, in recognition of their position and service in the coming year. The outgoing president, Patricia Scott, reviewed the accomplishments of a very successful year. Events and projects in her year included donating over 200 dictionaries to teachers at the local schools; scholarships; food baskets at the holidays to needy families; a book drive to send books to villages and schools in Africa; clothing for children in Nicaragua; bicycles to students at the elementary school in recognition of perfect attendance; and probably the largest and most important, helping organize and staff the Hurricane Relief Center at the Community Center after Hurricane Ike hit the area. For all these efforts, the Greater Highlands-Lynchburg Chamber of Commerce recognized the Rotary Club this year as the Outstanding Organization in the community. The District also recognized the club for highest per capita giving to the Rotary Foundation. In fact, two years in a row the club was second in the world in this category. One project the club is still working on is a suitable memorial for Mark Mulloy, a former member of the Highlands club, and now a member of the Northshore Rotary. He recently donated $50,000 to the Highlands club, in memory of the start he got in Rotary at our club, and a suitable scholarship in his name has been established. It is the intention of the club to use the proceeds of the money for a more permanent memorial in the future, Scott said. Note: All photos this page contributed, courtesy of the Highlands Rotary Club and Denise Smith. 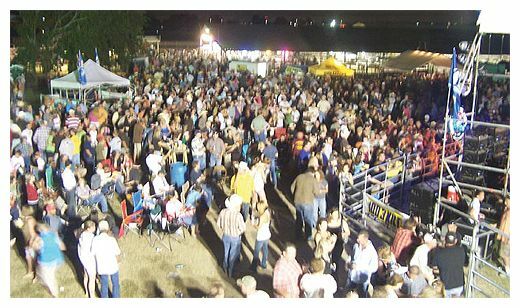 CROSBY  Success builds success for the Crosby Fair & Rodeo, Jamey Johnson packed the Fairgrounds Saturday, June 6 with the largest crowd to attend an event here; now volunteers anticipate greater records over the three days of Rodeo and concerts through Saturday.